1. Dynamic and custom filtering. In the beta version, searching was static and limited to the checkboxes that appeared on the screen. The checkboxes were pre-determined and therefore could not be changed. This was fine for beta, but in real life someone using the program would need someway to tell the program what kind of documents they had in the program. 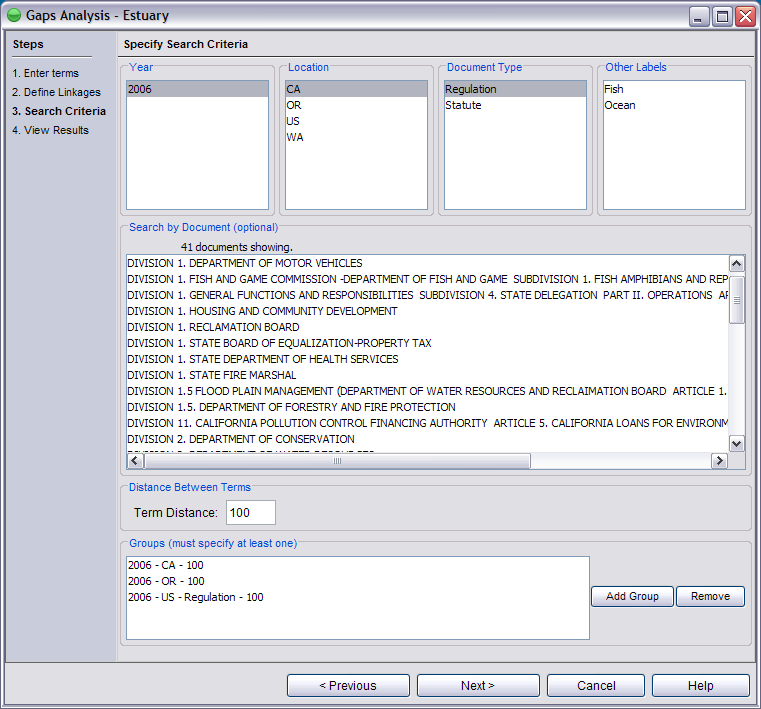 In the beta version, law documents were neatly divided by sections into smaller documents called "granules". Granules, as great as they were, posed a problem due to the fact that there is no technology freely available to parse your own documents into sections (well, there is, but each jurisdiction handles their documents differently and the separation process is actually quite tedious.). Adding "Term Distance" mimics the functionality of dividing documents into sections by constricting the distance that two terms must lie within. Term Distance is the maximum number of words that can appear between two components in our ecosystem model. Let's say that we have one term "lobster" and another term "trap". A Term Distance of 0 means that trap must immediately follow lobster ("lobster trap") or vice-a-versa ("trap lobster"). A Term Distance of 100 means that there can be up to, but no more than, 100 words between "lobster" and "trap" in the document (the order that they occur in the document doesn't matter). Term Distance applies to every component in the ecosystem model. 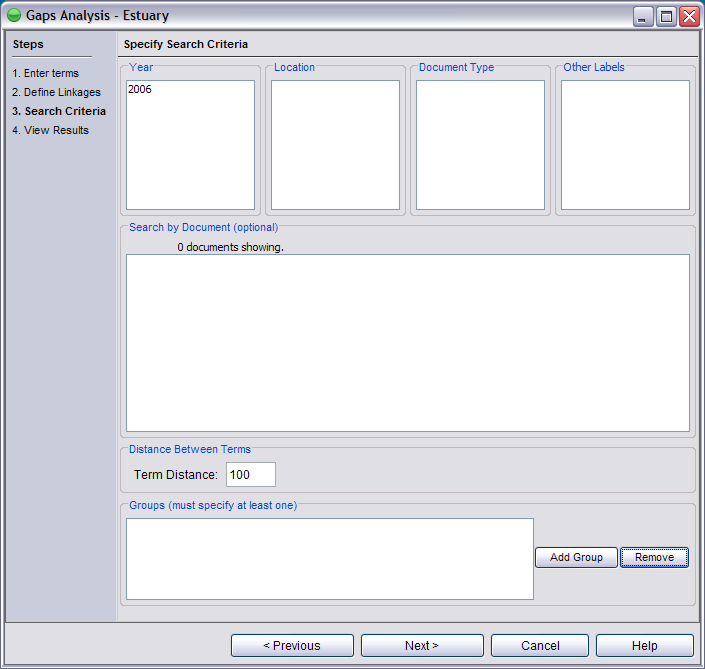 To create a Group, simply select the search criteria, set the term distance you like and click the "Add Group" button. You need at least one group to run an analysis. 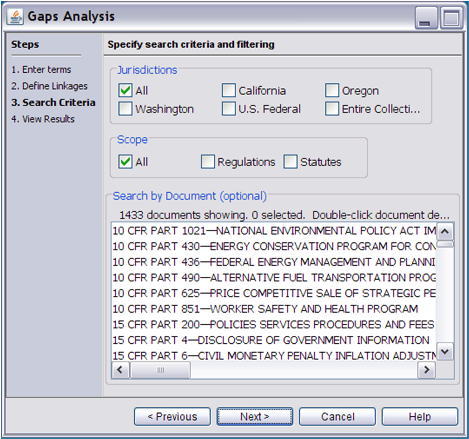 Once your criteria are defined, click Next and the program will run the analysis.